ThinkingPinoy can still remember the first time he watched “Legally Blonde”, where he first heard Aristotle’s line, “Law is reason free from passion.” Now that pretty much the entire country is agitated with #BangkoSerye, I think it’s time to evaluate the situation with pure logic and zero emotion. Scenario 1: Duterte waives secrecy, Trillanes is wrong. Scenario 2: Duterte waives secrecy, BPI system has limitations. Scenario 3: No affidavit from Trillanes, Duterte refuses to waive secrecy. Scenario 4: Duterte waives, Trillanes is totally right. Scenario 5: Duterte waives, zero-sum transaction pairs found. Interestingly, what actually happened on Monday appears to be a hybrid of Scenarios 1, 2, and 3. Confusing? Don’t worry, hihimayin ito ni TP para sa iyo. To do that, let’s first list down all relevant information. Duterte was represented by Atty. Sal Panelo, a legal heavyweight. That is why TP, along with several other netizens, were confused as to why Trillanes did not even bring a lawyer with him. @indayevarona @SagadaSun wala lawyer si Trillanes non? Now i pity the guy. 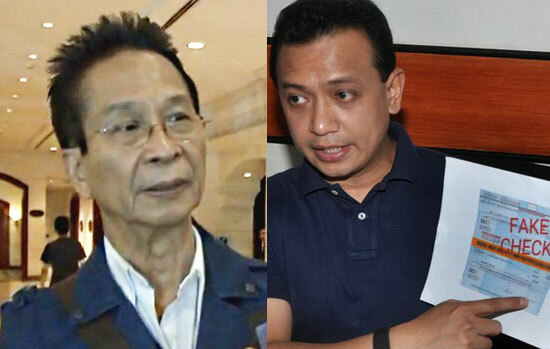 Panelo also serves or has served as chief legal counsel for punta-ka-condo-dala-u-food Cedric Lee [ABSCBN], the Ampatuans [MB], and Bong Revilla [ABSCBN]. Only legal geniuses will have the guts to defend those three. And there was Trillanes, all alone to fend for himself. Trillanes is not very smart. But let’s set that aside for now. Now, let's have a quick recap of the BangkoSerye timeline. April 27, 12:58 PM – Trillanes says P211 million just a part of massive underdeclaration, withholds release of additional evidence pending “validation by accounting” [Inquirer]. April 28, 1:24 PM – Ellen Tordesillas’s friend goes to BPI Julia Vargas, deposits P500. Deposit slip consummated [ET]. April 28, 3:09 PM – Duterte admits existence of 2 BPI accounts, claims outstanding balances are less than P17,000 and P50,000. Agrees to sign waiver if Trillanes executes sworn affidavit detailing allegations [Inquirer]. 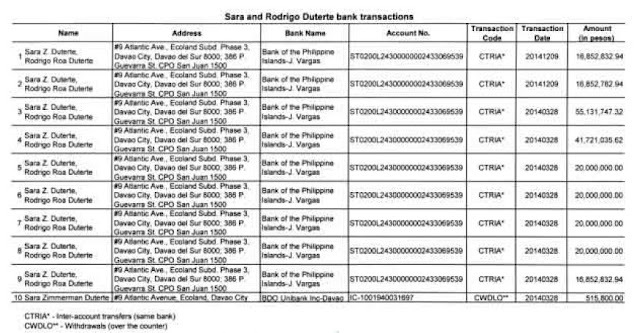 April 29, 12:19 AM – Trillanes expands accusations, says Duterte had P2.4billion in transactions in 17 accounts over 9 years [Inquirer]. April 29, 6:29 PM – Trillanes clarifies he needs transaction details for past 9 nine years, says nothing about executing an affidavit [Inquirer]. Sen. Antonio Trillanes and Duterte’s legal counsel Atty. Sal Panelo both arrived in BPI Julia Vargas at before 11am yesterday. Media personnel and non-clients were not allowed inside the bank [ABSCBN]. Trillanes brought with him a sworn affidavit while Panelo brought a “waiver” in the form of an SPA, or special power of attorney, allowing him access to Duterte’s bank records. A couple of hours later, a stern Trillanes emerged, walked straight to his vehicle, granted no interviews, and advised media to attend his press conference at the Magdalo headquarters. The Special Power of Attornry (SPA) document allows BPI to say whether there’s no P211 million whether singly, collectively, or cumulatively, in BPI account. BPI rep verbally said no in front of Panel and Trillanes. BPI accepted SPA and request to issue written certification, but BPI asked for 7 days to comply per company protocol, as it’s not standard practice. BPI standard practice is to provide data on outstanding balance but Panelo insisted that BPI issue a certification, based on BPI’s records. Trillanes wants a copy of SPA. SPA already with BPI. BPI doesn’t want to give Trillanes SPA copy per bank secrecy law. Panelo said he can’t give SPA copy because he needs to ask Duterte first. Panelo told Trillanes that the latter can still read the entire document while they’re there. BPI told Trillanes they can’t just release transaction data per protocol, that they need to consult with BPI Legal. 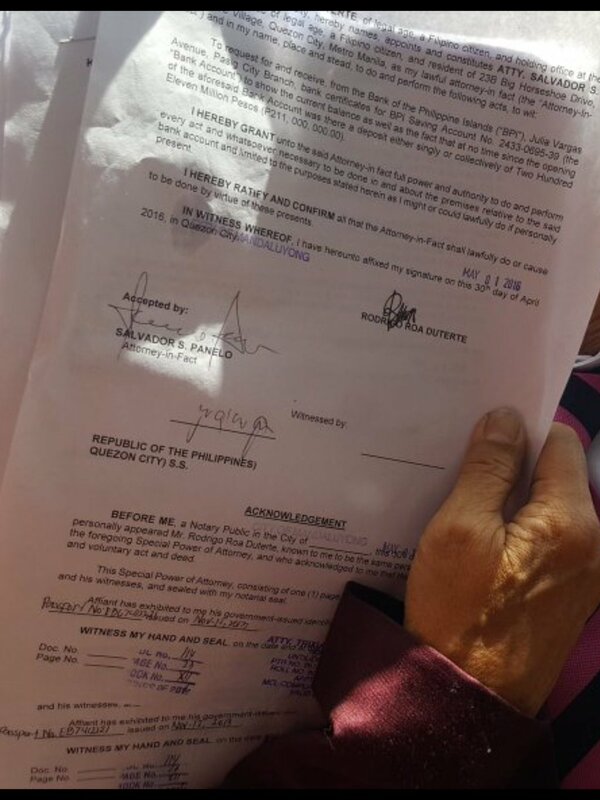 Trillanes gave Panelo a 2-page affidavit. 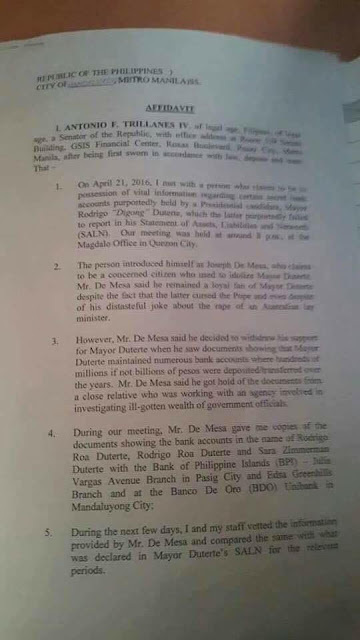 According to affidavit, a Joseph de Mesa approached Trillanes, saying he (de Mesa) has an acquaintance who claims Duterte has many bank accounts. Panelo said this is not only hearsay on Trillanes’s part, but also hearsay on de Mesa’s. 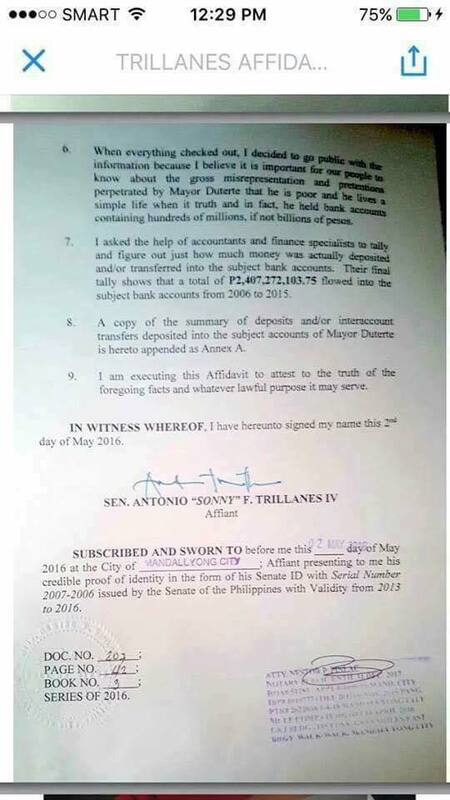 There’s an annex to the 2-page Trillanes affidavit showing alleged bank transactions. Upon examination, BPI said they don’t have such a form, that the list uses a custom-made, Non-BPI format. Panelo can’t release details because he’s not the bank. Panelo asked Trillanes if Joseph de Mesa is a real person or not, if Trillanes verified Joseph de Mesa’s identity. Trillanes insisted that Panelo refer to whatever is on the affidavit. Moving forward, we will be citing Panelo’s first point as [D1], the second [D2], and so on. In another interview, Trillanes said the following in relation to the BPI Julia Vargas “confrontation” [GMA]. 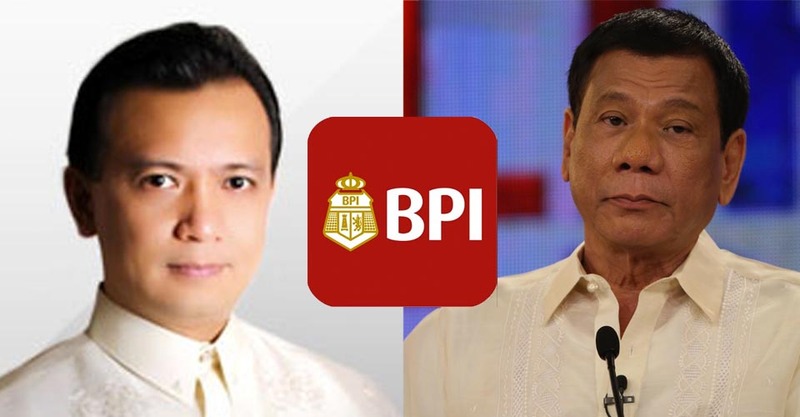 Let TP list down everything Trillanes said relating to BPI Julia Vargas. BPI did not show transaction records. Trillanes gave his affidavit, Panelo did not bring waiver. Trillanes asked help from accountants to tally and figure out how much money was deposited or transferred into the bank accounts, with final tally showing a total of P 2,407,272,103.75 that flowed into the accounts from 2006 to 2015. Trillanes said he got information from a Joseph de Mesa and “everything checked out”. Trillanes said he left bank after Panelo said he’s unauthorized to issue a waiver. Duterte never disputed Trillanes’ accusations. Trillanes admitted that SPA requested for account balance and statement from bank deposit transactions never reached P211 million. BPI to take 7 days to issue written statement because SPA does not include signature from Sara Duterte, who holds the account jointly with Duterte. Ombudsman and related agencies immediately investigate these kinds of issues. Trillanes claims Duterte’s threats to form revolutionary government with NPA leader Jose Maria Sison is real. 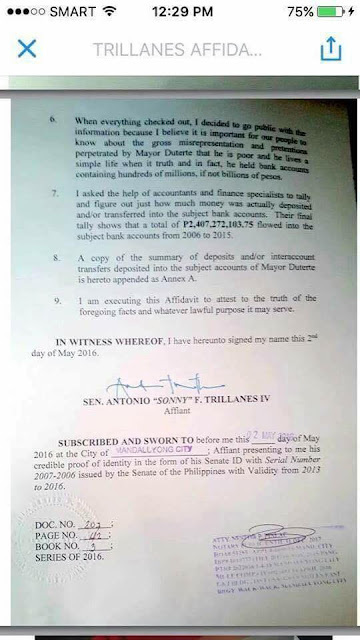 Trillanes received his information only on April 21st, hence the delay. Thinking Pinoy tried to find other statements from Trillanes but the news articles contain the same information. [Manila Standard], Philstar, Tempo]. Moving forward, we will be citing Trillanes’ first point as [T1], the second [T2], and so on. Now, the next thing TP will do is analyze information from both sides.